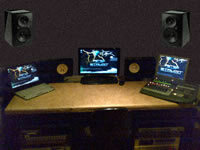 Featuring Mackie HR842 mk2 powered monitors (Bi-Amped) THX pm3 certified. Industry standard Yamaha NS10 Near Field monitors / Yamaha power amp. Sennheiser HD 600 headphones. Alesis, RME, Focusrite, Mackie, Fostex and Yamaha converters. RME, Focusrite (Class A), Mackie (Onyx), Walster© (Descrete) and Yamaha Preamps. Microphones by AKG - Audio-Technica - DPA - Sennheiser - Shure - Beyer - Electro-Voice - Rode - Trantec - Walster©, Sennheiser wireless instrument / microphone system, Sennheiser in ear monitor system, Custom built rack mounted Core I7 Mac Pro / 24" iMac / AMD Phenom II quad core PC, iPad / custom TouchOSC remote, 2 x 22" IIyama TFTs (Dual View) and 2 x 15" TFTs. Dell Core Duo / Sony Vaio Laptops, In House File Server Network / Web Server. Beyer DT 100 Headphones. Lots (Overdubs). Recording software: Cubase 7 / Pro Tools 10, Stereo mastering software is Adobe Audition (Cool Edit Pro) and Wavelab. Steinberg Houston controller with motorised faders. Loads of vintage outboard gear (Can be patched into the digital domain) Drawmer compressor, Drawmer gates, Aphex Aural Exiter, Yamaha SPX90 / Rev 7 ETC.. SMTP reader (Sync to tape ETC) Alesis Adat (Transfers). DBX / Yamaha Compressors. This is usually were we mix the recordings from our Mobile Rigs.